You want one hot box? 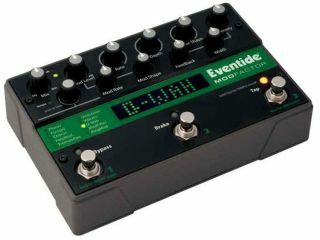 Then the Eventide ModFactor Modulation Guitar Effects Pedal is for you. Available February 28, 2008 (that's soon) the Eventide ModFactor features 10 modulation effects available in mono or stereo, including Phaser, Flanger, Chorus, Polymod, TremoloPan, Undulator, Vibrato, Q-Wah, ModFilter and RingMod. Face it, that's a whole lotta "mod." With studio-quality sound and extremely flexible control options, you may never need another modulation effects pedal. Ten knobs provide instant real-time control of all the most commonly adjusted parameters, and optional controls via MIDI or expression pedal keep the full power of the Modfactor within easy reach. Tap Tempo and MIDI clock sync blend effects seamlessly into any song, and 27 user presets (unlimited presets through MIDI) make it unnecessary to make notes and drawings to find that perfect setup every time. All of which means you can play more and worry less. Rugged cast metal construction means your ModFactor is ready for the road, and guitar or line-level inputs make it incredibly flexible. Through the decades, top players have depended on Eventide: Jimmy Page, Frank Zappa, Brian May, Eddie Van Halen, Steve Vai, Robert Fripp, John Petruccl, and Adrian Belew to name a few. Now, these effects are portable and affordable. Stompbox simple, ModFactor fits on your pedalboard or in your gigbag. Or even a coat with really big pockets, if you happen to have such a thing. And you can even upgrade your Eventide ModFactor via the Internet, so you never have to feel out of it when a cool new sound comes out. For $499.00 U.S., that's a fair price for more hot sounds than you'll know what to do with. Still not convinced? Check out this demo and hear for yourself.